It’s a brand new day! It’s a new month – yay! This is the point when we get a do-over for good intentions. For instance with the blogging. Even the best-laid plans sometimes fail. Nothing can be done for the days lost in January, it’s now a fresh month. In the past, I have taken all of my unfinished plans from the previous month and started there before tackling the items I had designated for the current month. That is a fast track to being overwhelmed and giving up before you even begin. Trust me, I’ve done it numerous times. For instance, with my bullet journal, I had an entry on January 22, then nothing. The next day I felt nearly human again after several days of illness is January 30. Last year, I would have felt guilty. I would have made entries for each day in between, trying to squeeze something from the brain to fill in for those days, but this time I didn’t. NOPE. I simply wrote ‘And then . . . ‘ in large bold letters, with a brief journal entry about what was going on, namely, I felt miserable until my daughter took me to urgent care. Then I made an entry for Monday with the header Moving Forward. That, my friends, in a nutshell, is my entire philosophy for the year. So, of course, this is the perfect time to add something else to the mix, right? Of course, it is! 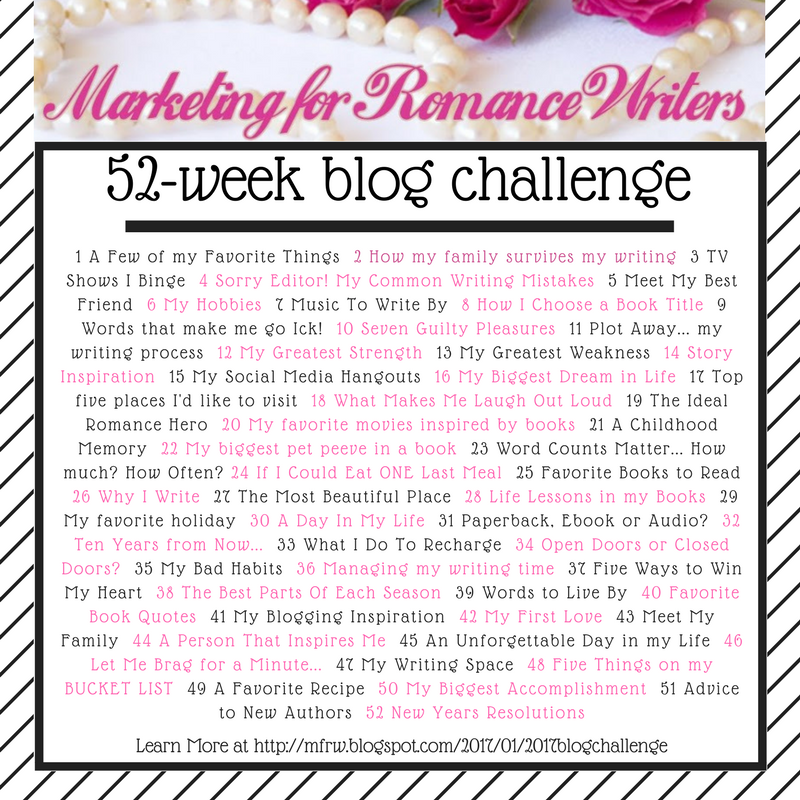 An author friend has been encouraging me to join this blog hop thing, 52-week thing. I’m already behind the curve, but I can make those up, no problemo! You’ll see the first installment for this on Friday. What’s one more thing, right? Following the categories that I have already used for blogging, I will on occasion – I’m not even going to say I will post every Monday because you know as well as I do that I may or may not manage every Monday. Seriously, take a look at my list above! BUT, I guarantee you that at some point throughout this month, I will give updates. I had already agreed to share tidbits of the WIP, which will cover item number two. I will share a couple of things throughout the month on editing. This is something that I’ve thought about many times, making editorial posts to address common mistakes that we all make and are things that you can fix yourself. BUT, I was wondering does anyone even care about my weight loss and fitness journey? Does anyone really care about my home improvements? Renovations? Updates? IDK – I had thought about sharing that month’s projects with pictures of before and after, but does anyone really care? Honestly, I am not doing major renovations like tearing out walls or adding on to the existing floorplan. We are on a tight budget here and most of these changes are simply going to update and make our house saleable. I’m still undecided on those two points, but if you have an opinion feel free to comment or message me. I’m heading to my editor’s desk to dive back into this book. I haven’t touched on the bujo in a while, so it’s time. First a bit of refresher. back in June, I got the bright idea that I could streamline my efforts and go with a weekly spread. this was a bad idea. Not only did I feel stifled just like using those premade planners that eventually find their way to the trash bin, I didn’t stay on task and was easily distracted. Oh, I made an effort to use it. I tried to convince myself that this was efficient. LIAR! This was the first week. I made an effort, really I did. but as you see, there is mostly blank space on this spread. The next week was just as bad. Then I decided, I know, it just needs to be jazzed up. So, I added a few doodles and tried to make it work. I ended up with more blank space and not using my bullet journal at all. The only thing salvageable for the month was my graph for word count. I liked a couple of the doodles I did, but overall I will give the idea a big fat F for failure. Check out my zodiac sign and the birdcage – not too shabby. I needed a little self-motivational talk, some encouragement, and a means for a little artistic leeway. I’m never going to be a graphic artist, but for my limited skill level, I thought it turned out well. Some days I managed to use my bujo, others I did not. There are parts that seem like a redundant repeating todo list. It’s all good, though. After all, the main thing I need is to keep myself on task, and tackling my todo list. September’s Level 10 Life spread has noticeable improvement from the previous month. September dailies tracked my diet and water intake. I was diligent. By the end of the month, I had lost 7 pounds. It’s not record-breaking, but it’s better progress than I have had in a long while. My daily todo lists revolve around getting prepared for Penned Con. The last few days before the event, my bujo kept me from going into a full panic mode. The days after were jotting down note on the event, things that worked thing that didn’t, things to remember for other events and a wish list for the future. Which brings us up to October. I found some of my rubber stamps that are fall and Halloween related and I’m having fun! A two-stage stamp of a pumpkin is replacing my usual banner shape for the day. My mini cube ink pads are adding some pizzazz to my pages. On my month at a glance, I have a stamp of a seashell that I absolutely love across the week that we are going on vacation. Yes, I’ve been counting down the days! It’s strange, last year after my debut at Kentuckiana with Red Wine & Roses, we went on a cruise for a milestone anniversary. When we left Freeport Bahamas, a hurricane was fast on our tail making for a rocking time on the trip home. I won’t say it was a rocking good time because if I would not have had that little patch behind my ear, I would have been medivacked to shore. So this year, our vacation plans post Penned Con where Quotidiandose: 30 Days of Sass debuted are to Florida and guess what? Matthew is going double live GONZO terrorizing the Florida and eastern coast. What is the deal? My heart and prayers go out to all of the folks own there and in the path, whichever path it ends up taking. I am mentally going through statements that I have made in the past of surviving a tornado, a flood, earthquakes, and wondering if I ever said out loud any comment of a hurricane. Someone come give me a beat down if I ever say anything about a tsunami! So, back to the bujo. I have made progress from things that everyone else was doing that sounded practical to making my own method that truly works for me. I’ve kept the little weekly chart for tracking my word count. I like that much better than the app that used to be on Facebook. A bullet journal aka bujo is a tool. Mine is customized to me. That’s the beauty of this, you make it your own, make it work for you. If you are a minimalist then the weekly spread might be your thing. If you tend to journal a lot then a lined journal might be your best bet. I need change. (You know, the thing yesterday that I was accused of not being able to handle?) I need variety. There’s a bit of this and that in mine. It’s not perfect, but it’s perfectly me. By the way, it’s going with me to Florida. We are both in need of some R&R. The plans consist of wearing as little clothes as possible while not getting arrested or terrifying small children. Walking from the hotel to the beach ( A istance of about 20 feet), staring out across the ocean, listening to the waves, collecting shells, and drinking margaritas at sunset. But before then, I have several items still on my todo list. You can go over to Youtube and follow me there. I would appreciate it. There isn’t much there yet, but I will have more eventually. I better go check what else I have left to do. Life is constant chaos. It throws curve balls at you, it throws spit balls at you, then when you’re expecting a curve you get a speedball. Do you ever wonder if there is someone up there dropping trouble into a machine like they use at a batting cage? NO? No one but me? I tell you what, sometimes it seems that would be more logical than what is truly going on. I was expecting to dodge, parry, thrust and my thrust was misdirected due to a secondary dodge and pivot. I try to anticipate, but more often than not I end up on the defense instead of offense. This is where that part of me that likes plan and order goes nuts. Enter the magical powers of the bujo – my sanity keeper. Well, attempted sanity keeper. For this month, I tried a new thing. A weekly spread seemed like a good idea at the time. It’s all right there and I wouldn’t be redundant in my daily to do lists. As it turns out, this wasn’t such a good idea. I entered a few things, but for the most part, I ignored it and fell into old habits. Those habits that I worked so hard to break. The ones that kept me in the same loop time after time. One feature that I do like however, is that little box in the middle of the right-hand page. See that space called word count? YES! My weekly total for May 30 through June 5th – 7,321. For the week of June 6 thru June 12 however, my word count for the week went up to 10,083 with a whopping 6352 for one day. This week I had one day with a word count of 6214, and a total for the week of 12,608. Do you see the trend? Do you see the increase? This part is working much better for me than the graph chart for the month. Next month I’m going back to daily entries, but I am going to figure out a way to incorporate this little gem. I like the freedom to doodle when I want. I like the idea of order and structure. It seems like the right thing to do but I find it inhibitive. I would rather have the same to do list practically every single day, because face it – life is routine most of the time and days blur into each other out of routine – than have a sterile planner that I don’t use. I think most of my friends would agree, this isn’t me. The previous pages I’ve posted are more me. A little messy, a little artsy, a little order, . . . but all me. This is an idealistic outline, sort of what I do with my books. This is the backbone – the place to start. Then we build from there. Will it have long legs? short legs? Will it have a tail? domestic or wild? Who knows what it may morph into, but I can guarantee that it’s not as simple as this weekly layout. If you notice, I had to jazz it up a bit with a couple of flowers. The section for Funky Junk – that’s our resale business. I like that as well, as this past week I have some great tips written down there. I am considering making a single page entry for our home business instead of just a little box. That way, I can write down all those little tips and tricks and business ideas in the same place. A bullet journal is a personal tool that can be adapted to meet your needs. You don’t have to do it the same way I do. Which is a good thing, because I don’t have it all figured out yet either. I’m still molding mine to fit my hand. You know the best part about a bullet journal as opposed to a preprinted planner? It’s changeable. The outlines are unwritten. Nothing lays before my eyes but blank squares on a page, waiting to be transformed into a bright future. You should write that down, that’s good stuff right there. That’s all each of us have, each day of our lives – blank squares waiting to be transformed. I should use that in a book! Write on my friend, write on! In one of my speaking engagements, I talked about goal-setting. I used nautical terms to get my point across along with images and youtube videos. Granted, most of the audience didn’t care about sailing and I knew that but by the time I had finished, a few simple terms stuck in their mind and several people sought me out at the end to share with me that they appreciated it. Tacking is one of those terms. Tacking is the heading of a sailing vessel, when sailing close-hauled, with reference to the wind direction. . . one of the series of straight runs that make up the zigzag course of a ship proceeding to windward. . . to change the course of (a sailing vessel) to the opposite tack. It is a zig-zag course as opposed to a straight line. It is the constant readjustment of your vessel to reach your chosen destination. There are 2 ways to accomplish this, through several small zags or fewer larger zags with greater impact. Small zags would be akin to my monthly adjustments when I evaluate where I am compared to where I want to be. Larger zags would be changing careers, taking a new job. Life will carry you downstream if you let it. Stuff happens. Disappointments happen. If you let the current carry you along, you will end up somewhere you didn’t want to be. Way back when I chose my first career as a cartographer, I had a fascination with maps, mapping, exploring, charting unexplored lands. Still have the fascination, just not the job. By the way, for those who don’t know cartography is the study of maps, a cartographer is a map maker. I made maps. I wished for the days of the large sailing vessels and to be an ancient mariner creating those magnificent maps that are adorned with sea monsters and forebodings such as “here there be dragons”. The career choice landed me a profitable career with our defense department with a tidy income and numerous perks. Until the point when I decided to pursue an alternate career choice that turned out to be the biggest blessing and the biggest source of stress. What are you going to do, right? I wouldn’t change it for the world, though. If you don’t adjust your compass heading, tack starboard or tack port, you’ll end up dashed on the rocks. I find myself diametrically opposed however, to certain individuals who believe – make a plan and stick to the plan. Keep working on THAT plan. But what do you do when that plan is snatched from your grasp? What do you do when the company that you have worked for twenty years decides they need a cutback? It’s nothing personal, they just need to cut their workforce by 15% and you happen to be on the list? How does that figure into THAT plan? It doesn’t. That’s when life has dealt you a bad hand and you can’t even bluff your way into a winning round. So you adjust, overcome, improvise. Pull up your big girl pants, put on the steel boned corset and chart a new course. It’s far easier to make minor adjustments on a regular basis than end up in some strange land where you don’t speak the language and discover that you have lost your way. Today is that day for me. I evaluate where I am on my projects and determine my plan of action for the coming month. Last month I started on the massive project of caring out an office area in our basement. I shared pictures of the unfinished but mostly clean area. Another project moved into top priority and I lost some ground. The temptation to put stuff in an empty space is too great for some people to resist. I’m not going to name names as I am guilty myself. I don’t even have an office yet, but I have shelves of my writing related stuff moved in. It would have been so much easier to get flooring, walls, lighting, and all that painting business done first but it didn’t happen that way. I needed it out of my kitchen and living room where it was in the way. Anyway, tacking to the starboard. The plan for June on the office front is ramping up this project and focusing on existing writing projects. I’m not taking on any additional editing jobs until I get the ones I have completed. I hate falling behind and these will go back to the author with no charge. I’ve edited her entire series and I can see growth and improvement in her writing from the first one to this one. This is encouraging to me as a writer and as an editor because it means that my own writing can improve. It also means that it doesn’t have to be perfect to release my babies into the world. It’s not like the old days when the only means of publication were the big seven. It provides a moment of opportunity to tack starboard or port in my writing as well and adjust my course to reach my destination. Take a few moments today to check your headings. Where are you in comparison to where you want to be? What adjustments can you make in the coming month? year? What goals are you working towards? Do you need to set a new course entirely? I plan to start tomorrow on the right foot, the right headings, and make every day count. Wow, this week has been crazy! Anyone else having one of those weeks? OR is it months? My TODO list seems to be growing exponentially while the check marks are scarce. Every time I mark one thing off of the list, it seems three more are added. I’m beginning to wonder if there is a light at the end of the tunnel or if I have entered a one-way cavern that leads to the pit of hell. Currently, my vote goes for the latter. However, my relief was short-lived when I found out the conditions of not having to re-invent the wheel. *headdesk* Thus we come to the point of the story of where the mountain of work came from. I am behind on an editing deadline, I have an author chomping at the bits to get her book back. I must say, so far this one is the best one yet. I’ve edited the previous books in the series and there is a marked improvement from the first to this one! Sales in our resale shop have doubled this past month, which means more work for me to stock inventory. That is a good problem to have aside from the additional demand on my time. I don’t know whether to scream “Jane! Stop this crazy thing!” or double up on the coffee and ignore the caffeine addiction. At some point, I have to come up for air to catch my breath but in the mean time, I’m going as fast as I can. The only saving grace for even halfway getting these irons attended to is my bullet journal. It’s been a while since I’ve posted anything about it. My friend Dana has tagged me in her blog a couple of times pertaining to bullet journaling – hey girl! At the beginning of April I started a new bullet journal in a Leuchterm1917. SAy hello to my new BUJO! and it’s red! Also, this fountain pen is amazing. Isn’t it gorgeous? I set up my monthly spread as I had done for March, then quickly realized I should have made some changes. The calendar is ok, but I put it on the wrong side of the page. Oh well, no biggie I just put my tracker on the left. The next page spread is the month at a glance, and my Photo a day challenge for the month of April which was totally freaking awesome! I don’t know if you guys enjoyed it but I sure did. I’ve used dailies since I first starting using this system in January. I added a monthly todo and monthly goals on the next page, which left a blank page on the facing page. It was blank until I saw a cool thing on Pinterest, so I made this. I’ll color it in with red when I get a free moment or two. HAHAHA! That’s funny, that’s real funny. Anyway, between writing, editing, administrative job, and room shuffling my entries have been repeated todo lists. A little journaling, a little artsy stuff, some washi tape here and there, but most of all the daily reminder of what needs to be addressed. Here are a few that I liked. In cleaning up downstairs I found some of my rubber stamps that I had been missing. They were stuffed into a box and carried downstairs to be put away later. *hangs head*. The roses in the corners are stamped, the background script is a large stamp. What can I say? I’m a big kid at heart. I find a misplaced toy and I have to play with it. The numbered items (11,12,13) are from a challenge from a bullet journal group, and as you can see, I have way too many arrows to forward items. I got tired of putting a P for partial completion and just left it open. If I had an arrow from the day before, it was the first thing I addressed the next day. Well, with the exception of reading that book. I still haven’t read it. It’s still on the to be read pile. It’s not fiction so it keeps getting shuffled to a lower place in my stack. My happy little cup! I really like him!! My fleur de lies stamp – found treasures. The beauty of scrapbook paper – you can hide your mistakes! I tried to do some fancy calligraphy writing and botched it. Things I don’t like – you see those blank squares? I thought I’d do a doodle a day challenge. It didn’t happen. I got to day `10. Forwarded arrows. Hate them! In May, I used pink ink and it was waaaayyyyyy too much pink. I’m talking hurt your eyes pink. I did like this page however – I got to play some while waiting for a phone call. It was a matter of not starting anything because I knew any minute I could get the call and have to rush out the door. BTW- got to drive a big honking truck which was COOL! OH, and on the 13th I made a drastic change. I went from long thick hair – to a new style! No makeup here, sorry. I guess there should have been a warning. No that’s not pulled back, it’s gone. It’s all gone. 12 inches of hair – gone. Plus the amount that she cut after that! You see that box in the middle of the right side? the one that isn’t labeled? I decided to put a word counter there. I made myself a little chart to track my progress and hopefully keep me on track. I’ll send updated photos later, and admit my true word count – eep! I realize this seems utilitarian, but it’s the start. Who knows what doodles or whatnot may find it’s way onto the pages. Let’s see . . . where was I? The past few weeks have had me in a whirl. Life is like that at times, but then at others, it slows down for a moment or two. I went back through my planner for the previous month and this month evaluating where I am in my goals. I discovered back in April that I wasn’t doing so well on my yearly goals as I would like to but, my daily goals were getting marked off the list. I have a long way to go before I can boast about my pages, they are for my use not for the beautification of the internet. I am pleased though that I have made a modicum of success in productivity. I know that I have too many irons in the fire. I think it goes with my personality. But the secondary part of me protests at every opportunity. The hard driving task master Type A over-achiever barely allows enough time after completion of one task before pushing me to the next while the Party Princess gets excited about an achievement! Do you realize what an achievement means? It’s an opportunity for celebration . . .
“Stop! We don’t have time to arrange a party. We need to move onto the next task at hand.” Taskmaster states firmly before purchases occur. “Well, maybe a small celebration. Just the family.” Taskmaster back pedals to avoid a halt in production and appease the Party Princess as she recalls the last halt lasted several days. “No party? No decorations?” Party Princess’ jaw clenches tighter. “Yet. I said yet. We still need to get the wiring done, the light fixtures installed before the drywall can go up. Then you can tape, spackle and after that, paint.” Taskmaster enunciates the words in irritation as she glances over the long list of things yet to be accomplished. Task master’s head sags in defeat. (This is the part where the task master debates the consequences of giving in to the inner child and allowing a bit of celebration. Without the party, the princess will pout, mope and not cooperate with anything productive. The balance of time lost in production opposed to time lost due to pouting and the latest shiny make the decision an analytical decision while the Princess solely operates in the emotional realm. If not resolved, it quickly can cause the chakras [I know I may not be using that right, but I hope you understand what I mean] to be out of alignment and chaos will ensue. This is a delicate situation. For those who are new here, I am not truly bipolar or split personality. I am not making light of those things either. Within everyone’s personality are dualities and traces of sometimes a third minor aspect to make you who you uniquely are. My personality goes back and forth between these two. This was an easy way to share why I don’t get more done. Not making excuses because sometimes the Taskmaster wins, sometimes the party Princess wins and sometimes on rare occasions when the moon is waning, the stars are in alignment, and the jet stream is flowing in a general west to east direction without a major trough, they work together happily. The rational parts of my brain are screaming to the task master that if she allows celebrations for the small steps, the general morale of Party Princess will be at a higher level thus, production rates will increase. Party Princess is a fast worker when motivated. Hence the importance of deadlines! Meanwhile, while I am working on a truce between the two I am going over my planner. Some adjustments need to be made for the coming month. This month has looked like one of my old planners with appointments, meetings, daily tasks and not much else. The inner child must not feel oppressed while the adulting task master must feel like something is getting accomplished. Take some time to celebrate your small victories because life is a journey. One step after another, along the path that leads to your destiny. Enjoy everyday life along the way to get to where you want to be and don’t wait until you’ve arrived because tomorrow is not a guarantee. How many of you are procrastinators? Oh, come on don’t be shy. I admit, procrastination is my arch nemesis. Has anyone ever visited Wait But Why blog? Tim Urban states it succinctly. He is quite brilliant but difficult to follow at times. I imagine that many of you probably think the same about me when I change directions without signaling. There are a couple of truths that hit home with me. The 11th hour push. The deadline is 6 weeks away – I have time. The deadline is 4 weeks away – I have time. The deadline is 2 weeks away – I should get on that, . . . right after the YouTube video, then the next one, and the next one . . .ooh, shiny! The deadline is HOLY CRAP IT’S 2 DAYS FROM NOW – Work like a madwoman, writing 65000 words in 48 hours skipping meals and sleep, contemplating depends as a means of cutting down on interruptions. I’m just joking. About the depends anyway. Whatever the THING that is most important, now becomes the least fun. Think about it, it’s true. a) I am an author. Top priority should be writing my books, yet when I sit down to write my mind races with the NEXT book idea. It’s not a matter of writer’s block for me, it’s a matter of focus on the project at hand. b) I made the commitment to rent space at our antique mall to sell some of the many things we own and sell some of my handcrafted items. Making the stuff is far more fun than tagging, logging and tracking the stuff. c) Much needed housework is not fun and becomes an easy to put off task resulting in clutter until the point that I can’t stand it and it’s all out war. these are just a few examples. Being an authorpreneure leaves an open-ended schedule. I need deadlines. (Refer back to item 1) I try to set my own deadlines, really I do. But it just isn’t the same. My deadlines are more like guidelines, like the Pirate’s Code – more of a guideline. OOH, maybe we could watch that this afternoon since it’s rainy and . . . NO, I must have stuff ready for the booth by Friday! See? I have a deadline. This isn’t a self-imposed deadline, which is a guideline. This is a hard date deadline set by someone else, in a business that I have paid hard-earned money to. I had a Fifth point, really I did. Otherwise known as the squirrel, the rabbit, the shiny. Distractions are a procrastinators kryptonite. So what do you get when you combine a Creative, a writer, an idea person, and procrastination? ME, you get me. You get a creative person that struggles with time management needing a firm deadline in order to stay on task. The good news is that procrastination can be overcome. YAY! IT’s not easy, but it is possible. Breaking the procrastination cycle takes hard work and constant vigilance. I haven’t achieved that yet, just so you know. I mentioned the planning projects as means of procrastinating. This is where the bujo is a double-edged sword. I will elaborate more in a post about my bujo, but briefly : I am in a group on Facebook for bullet journaling. In this group, many of the people share pictures of their gorgeous planners. I look at my planner which is mostly writing and I get journal envy. I have to remind myself that it’s a tool, not a plaything. Many of the women in this group (there may be men that this applies to, but I have only seen women.) spend hours decorating their bullet journals, working on their writing, tracking everything you can imagine. I found myself trying to decorate my bullet journal to make it prettier, and falling behind on my to-do lists. So the very thing that I began using for the purpose of keeping me on task became a distraction to accomplishing those items on my to-do list. It only took me about a week to realize what I was doing and get back on track. Procrastination enables us to waste valuable time on things that don’t move us towards our goals, but instead keeps us in a waiting station on the ride to nowhere. Make a choice today to move towards your goals!